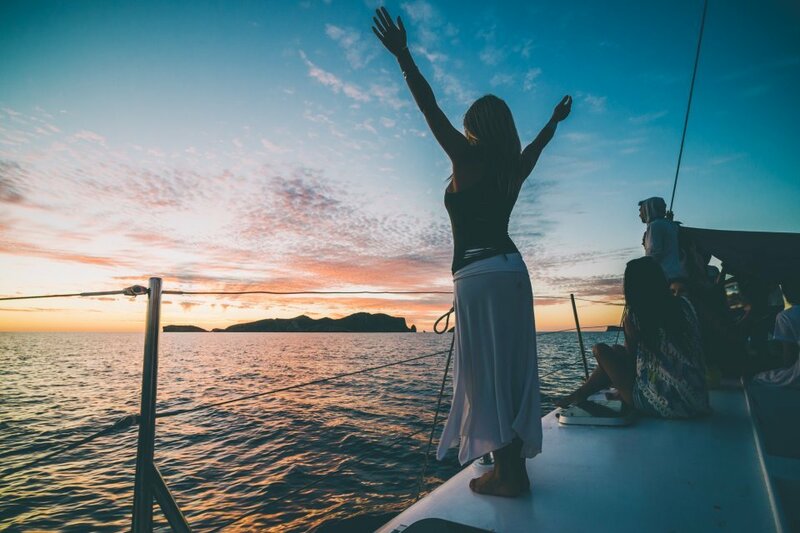 Brand new boat party launches for those who want something different. Your call has been answered. New for summer 2018, the Oceanbeat Catamaran offers an alternative to the popular boat party format. Setting sail from San Antonio every Thursday and Sunday from 16 May to 23 September, this is a boat tour in a class all its own. For starters, the capacity is capped at a strict 70 people on board so you have the luxury and comfort to spread out all you want. Oceanbeat Catamaran also stands out from the crowd by having a music policy featuring ambient, soulful and chill-out selections. This may be a welcome reprieve for those seeking a mellower boat party experience. After gliding across the sea at a leisurely pace, the catamaran will come to rest off the cusp of Cala Carbo in view of mighty Es Vedra. Anchor will be dropped in this prime spot to let you watch the sun go down next to the mysterious rock. Essentially a floating lounge bar, the Oceanbeat Catamaran will grant the most enviable views imaginable. Whether to take advantage of the magical photo opportunities or simply take in the view and savour the moment remains up to you. What's more, with an authentic Spanish vibe, this boat party provides a selection of tapas and pinchos - all included in the price. As you feel the sea breeze on your face, stay hydrated with as many soft drinks as you wish while flamenco dancers put on a show. If chilling is your main impetus, this boat party is for you. Not to worry if you fancy a cheeky tipple, though; you can also get drink package upgrade. As the night draws on, the tempo will steadily increase. By the time the boat docks back in harbour, expect some dance floor style house music. Dance as much or as little as you like, of course, although the buffet might put a spring in your step. The Oceanbeat Catamaran is an altogether more relaxed affair. You can simply sit back and unwind to the chilled selection of music, without any pressure whatsoever. If you do want to kick it up a notch later on, your ticket also includes entrance to a club. Whilst it may vary throughout the season, the list will include some of the island's top super-clubs. We can't wait to give this a go ourselves. Even though we love a party, there is so much more to this beautiful island. It's great to mix things up every once in a while.